1994: We move in to our house, a 1950s weatherboard in Melbourne's inner west. The back yard is small, and paved with grey cement bricks. There's a shed with a dented roller-door. A Hills Hoist. A patch of grass. A medium-sized gum tree. A straggly geranium. A palm tree, one metre high. An old Greek guy is one of our neighbours. He has two hobbies: playing the bouzouki, and reporting cars for parking infringements. We're told he's a well-known musician around the local Greek clubs. We don't see much of him, but sometimes we hear plunka-plunka-plunk from the other side of the fence. We're not very good gardeners. We plant pittosporum trees, but half of them die. We plant a passionfruit vine that never fruits, but then we can't get rid of it. I take up the grey cement bricks and replace them with pink and yellow pavers. Sometimes I sneak a peek over the fence into the neighbour's yard. He's got loads of fruit trees. Pears, figs, lemons, olives. Rosellas scream and fight in them in summer. 1998: We have two babies. They learn to walk and ride their trikes on the grey bricks. Alicia falls and cuts her chin on the back step, requiring two stitches. I build them a cubby house. The palm tree is two metres high. 2000: I invite a mate over and together we pull down the old shed built by a previous owner. It has a crazy, irregular frame, with studs and joists at peculiar angles, and wiring out of an electrician's nightmare. I hire a jackhammer from Bunnings and smash up the cement floor, chucking the bits into a skip. Our daughters ride their bikes in circles around the newly spacious yard. The geranium is still there. Even in years of drought and water restrictions, it lives on amid the devastation. 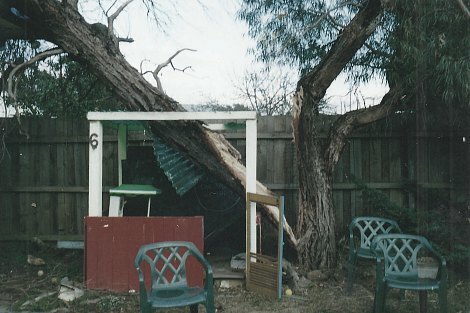 2002: On a night of storms, the gum tree splits and falls, destroying the cubby house and smashing the roof tiles over our bedroom. At 3am, orange-suited SES men and women climb onto our roof with chainsaws, trimming off the branches before lowering the trunk to the ground. Our neighbour emerges in a dressing gown, waving his arms. We plant a new gum tree. 2006: Gradually we take control of the yard. We plant vegies and a lemon tree of our own, banksias and grevilleas. Sometimes the rosellas visit our backyard now. We get a trampoline and the girls spend whole days bouncing, looking over the fences and checking up on the neighbours. I build a deck and we sit with a drink, watching them bounce or shoot goals through the netball ring. The palm tree is five metres high. 2014: I am sitting on the deck reading an essay by George Steiner on the decline of classical knowledge. 'The world of classical mythology is receding from our reach,' Steiner writes. My older daughter is strumming her guitar, a melancholy Elliott Smith tune answering the plunka-plunk of the bouzouki. I try the persimmons. The hard ones are too astringent to eat, but the soft ones are sweet, sticky and delicious. Were they really the lotuses in Homer's Odyssey? I decide to believe they were. Steiner was wrong. Mythology is here, in the backyard. There's many a good story in a backyard and this is certainly one of them. But, of course, backyards are getting smaller and smaller these days. Not so many lemon trees. Not so many stories. I learned something today - the lotos was a persimmon! Soft and sensual and messy. No wonder they did not want to give up their life "propt on beds of amaranth and moly." Certainly better than the alternative - "long labour unto aged breath", 70 say. Thank you, Nick. Nice story Nick. You seem to have the knack of making the ordinary exotic, May you continue for many years. A lovely story Nick and great to hear you're into growing your own these days! A very engaging piece of writing Nick. Your story highlights how we protect what we love and value. The gesture of sharing it is indeed very powerful and can level the divide.